Tickets are $12. 21+ Event. 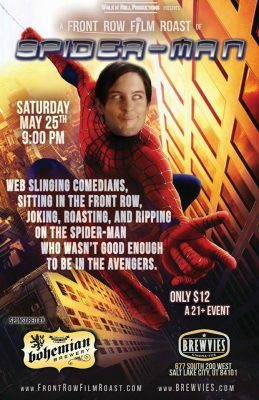 Web-slinging comedians, sitting in the front row joking, roasting and ripping on the Spider-Man who wasn't good enough for the Avengers. Drink and beer specials sponsored by Bohemian Brewery. **We strongly recommend coming early to get your drinks and food to help the line go quicker near showtime** Starring: Craig Sorensen, Andrew Sproge, Jessica Sproge, Trevor D. Kelley and special guest comedian Sam Poulter.